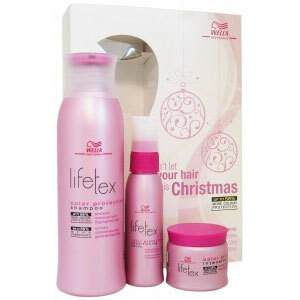 Keep your colour protected and looking vibrant for longer with Wella�s Lifetex Color Protection Regime. A full haircare regime for your coloured hair it will ensure your hair stays healthy and colour-perfect thanks to a vitamin E sealing complex. Follow the three step Wella Lifetex Color Protection Regime to keep your coloured hair from fading, allowing you to step out in style and confidence. Protecting your luscious locks against everyday damage this regime will keep your gorgeous colour for longer. Wella Lifetex Color Protection Shampoo � 250ml Start your regime by gently cleansing coloured or highlighted hair with the Wella Lifetex Color Protection Shampoo and give your colour protection and longer lasting colour brilliance. Wella Lifetex Color Protection Conditioning Spray � 50ml Provide your coloured and highlighted hair with an instant and intense treatment from the Wella Lifetex Color Protection Conditioning Spray, and give it the silky shine it deserves. Wella Lifetex Color Protection Intensive Mask � 50ml Pamper yourself and treat your hair once a week to an intensive condition with the Wella Lifetex Color Protection Intensive Mask. Show your hair a little TLC by protecting it against the fading influence of everyday damage.